Finnish power metal band Battle Beast have the innate ability to do a few things, one is to get the foot tapping along with their music, two is add a feel good party fervour to this music and lastly get these songs stuck within the head so that they repeat endlessly within the brain. Now that last one is no easy feat and the bands last album ‘Bringer Of Pain’ was full of these styles of songs. 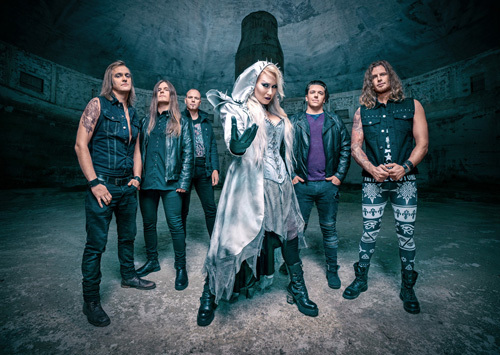 However, ‘Bringer of Pain’ was an album where the band had to find their feet again, adjusting to the loss of primary songwriter and guitarist Anton Kabanen as well as still bedding in the powerful banshee voice of Noora Louhimo. Yet, ‘Bringer of Pain’ was still wholly enjoyable if not a little flawed. 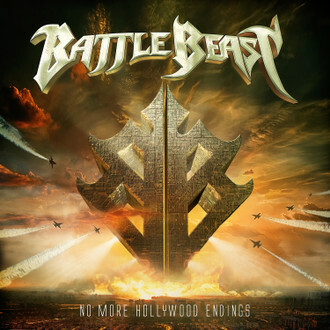 This ultimately put the pressure on for Battle Beast’s new album ‘No More Hollywood Endings’. Fortunately, ‘No More…’ not so much knocks the door down, as much as boots it into next week with a perfect blend of insatiable Euro pop melodies and modern power metal. This album is hugely aesthetically pleasing with a huge polished sound which provides an almost perfect canvas for the band to deliver their sound; tracks such as thumping riff to ‘Unfairy Tales’ which is almost the nasty cousin to ‘It’s My Life’ from Bon Jovi or the cheesy 80’s drums of ‘The Hero’ that manages to takes Bonnie Tyler to the next level. It is this melding of the classic Battle Beast sound mixed with cheesy pop dynamics with the integrity of Sabaton that can be seen during ‘World On Fire’, the demolishing opening track ‘Unbroken’ and the rampaging ode to Genghis Khan ‘The Golden Horde’. These tracks really show off Louhimo’s vocal power and she jumps from an oozing emotive voice to a screaming banshee at the drop of a hat. ‘No More…’ is a huge step forward for Battle Beast, the band have taken on board the niggles which plagued ‘Bringer Of Pain’, addressed them and hit back with an album which is firing on all cylinders. It may not be the heaviest album of the year, but it may be one of the cheesiest; yet it is this sound which also makes it the most memorable.